Thai Tea with a Twist! My friend Doreen introduced me to Fluff Ice in Monterey Park. I took sampled the original and peach flavors. It's flavored ice shaved into ribbons which are actually good, esp on a nice day. And Yesterday they introduced a New Flavor! Where else can you get a Thai Tea dessert? Before heading to the Gaslamp District, I stopped off to see my friend Kate and to sample her latest sushi creations, see Miss Sushi San Diego. 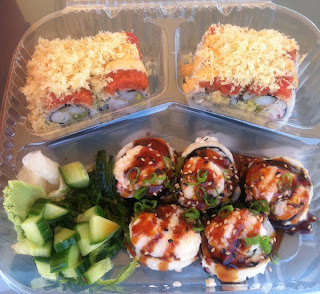 Shrimp Tempura Roll topped with spicy tuna, spicy sauce, and crunchies. Eel, salmon, cream cheese, imitation crab, avocado, Halibut, dynamite sauce, and eel sauce. Both rolls very good and served with cucumber and seaweed salad. Go see Kate! No bacon flavor, just tasted like maple. 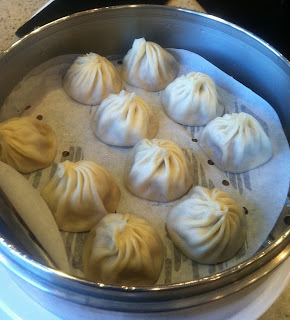 It's funny to hear from my friends who go to Taiwan and come back to tell me about this great dumpling house with Xiaolongbao (soup dumplings). I ask if they went to "Din Tai Fung"? The answer is always YES. I tell them they have a Los Angeles location in Arcadia and this one is much closer to home. Soup dumplings have a bit of soup inside them, so it's best to eat the whole thing vs trying to bit it in half. Be careful tho, when they come out of the steamer, the soup is very hot. When making them, they place a bit of gelatin inside the dumpling. When heated, this gelatin turns into a liquid, hence the soup inside the filling (pork, seafood, etc.). Geez, it's been over 10 years that I've been eating ramen here. In fact, on my way to Japan, we stopped off here to eat before getting on a plane for the 10 hour flight to Narita. 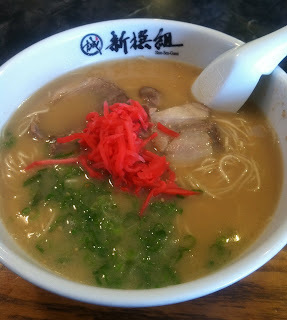 Hakata ramen is a tonkotsu based broth, made with pork bones. For lunch, I usually get the A-Set, Hakata Ramen and Pan Fried Mini Gyoza Dumplings for $7.25. 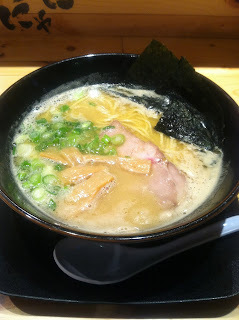 But today, I opted for the new G-Set: Hakata Ramen and a Beef Bowl. It isn't as good as it was 10 years ago. The broth doesn't have the flavor it once did and they're cutting back on the thickness of the chashu and also garnishes, I asked for extra ginger. It's a decent bowl of ramen and I can see why it's still popular, but not like it used to be. Having heard me talk about Ton Chan Ramen, my biz partner @Rhinofishfood wanted to meet up for lunch and try their famous tonkotsu ramen. 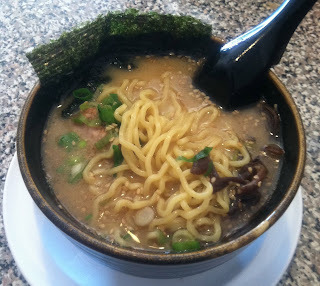 On my first visit, I noticed the lunch specials, see my first visit (Ramen Monday) with Doreen Fang. The 1/2 Ramen, 1/2 Fried Rice, and 1/2 Karaage Chicken stuck in my mind. Everything was well cooked and tasted great. This is a place that I would definitely come back to... They'll probably see me on September 4th for the Ramen Speed Eating Contest. Have to find an excuse to go back. Who wants to go? It was interesting to find out that peaches originated in China, for some reason I always thought Persia. Maybe it's because in school, I learned that the English name "Peach" comes from the Latin word meaning "Persian Apple", did you know that? Ton Chan Ramen San Gabriel (Now Closed) Heard from my Twitter friend @sherimiya that they went to Ton Chan Ramen in San Gabriel over the weekend and said it was a solid. Ton Chan Ramen has been on my list since they opened earlier this year. They're located right next door to Golden Deli on Las Tunas Drive. Since Sheri gave the nod, thought that it needed to be moved up on the list. My friend Doreen and I were having lunch that day, so I asked her if she was up for ramen? I gave the restaurant a heads up that we were coming in for lunch on Tuesday. Tokyo Shoyu $8.25 Standard Toppings: egg, chashu, and green onions Additional Toppings: bok choy and bean sprouts I asked Yukiko (server and twitter maven) for her recommendation and she mentioned the Tokyo Shoyu. 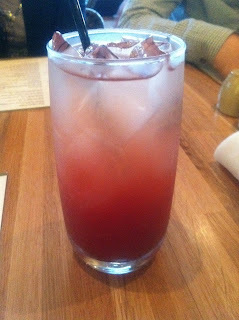 It's also my favorite, so that's what I ordered. This was my second visit to Mottainai. This time I ordered the Yokohama Pork Freaker (Mild), the first time I had the Tokyo Sho-yu Props ($6.95) with the White Bomb ($1.50). Not really a fan, but interesting syrupy broth Flavor was good, just wasn't a fan of the broth texture. Forgot to order the White Bomb (garlic flavor extra) for $1.50, they also have a Red Bomb (spicy) too. It adds a bit of garlic flavor or spiciness to the broth. Seems to be the question at Eat Cake Cafe, too many good things to eat. Tell them Chef Jay says Hello!